Is it safe to inject local anaesthetic with adrenaline into the pinna and external nose? Adrenaline containing lidocaine preparations such as lignospan are routinely used in ear, nose and throat (ENT) care. Despite this, textbooks and internet resources warn against their use in peripheries, including the nose and ear. As a result, they are commonly avoided by other specialties, such as emergency medicine. This article reports on the findings of a review undertaken to assess the evidence of harm associated with using lignospan in the pinna and external nose. A literature search was carried out, and retrospective data were collected on all elective facial skin lesion surgery in the ENT department at the Great Western Hospital in Swindon between 2005 and 2015. Cases using lignospan in the pinna and nose were included. The literature search revealed no reports of ischaemic complications of the pinna or nose following use of lignospan, or similar preparation. Of the 1,409 cases collected, no ischaemic complications were recorded. The article concludes that adrenaline containing lidocaine preparations such as lignospan are safe for use in the pinna and nose, and should be considered for use in emergency departments. 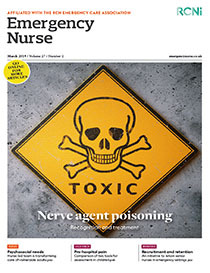 Share article: Is it safe to inject local anaesthetic with adrenaline into the pinna and external nose?